Looking for a more secure, reliable and efficient way to communicate? At Altech Electronics, we offer a wide range of mobile and communications solutions for commercial and industrial businesses. Whether you’re looking for a digital two-way radio or another type of digital conventional portable to enhance instant communications and heighten productivity across your teams, our expert digital communications specialists can help you find the right product for your unique needs. If you’re looking for a compact, discreet and lightweight radio that can easily be tucked away or attached to clothing, the EVX-S24 Portable Digital Two-Way Radio is a great solution for challenging environments. It can operate in both analog and digital modes, making it a great solution for businesses that use both solutions. 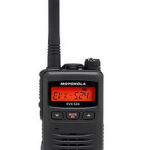 There’s also the EVX-261 portable digital two-way radio that has a broad set of safety features, including multiple scan options, emergency alerts, battery status indicator as well as low battery alerts, and more safety, signaling, analog and digital features and capabilities to make team communications secure and seamless. Have questions? Reach out to our analog and digital two-way radio experts to figure out the right fit for your organization. First time buyer? Read our buyer’s guide now or give us a call at (718) 266.7863. Don't know what you need? Contact Us for a Free Consultation! All other trademarks are the property of their respective owners. © 2018 Motorola Solutions, Inc. All rights reserved.